Jovovich brings an intensity to the role well-matched to Besson's stylistic energy, though this comic-bookish take on Jeanne D'Arc won't be winning any historical-society awards. 158 min. Sony Pictures Releasing. Directors: Luc Besson, Gerard Krawczyk, Jean-Paul Meurisse. Cast: Milla Jovovich, John Malkovich, Faye Dunaway, Dustin Hoffman, Tcheky Karyo. 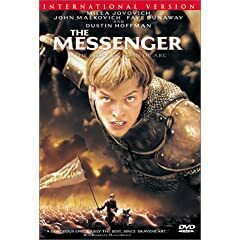 1999's The Messenger: The Story of Joan of Arc was a vehicle built for two: writer-director Luc Besson and his then-wife Milla Jovovich. In fact, by the time the film had its domestic release, the pair had divorced, after a whirlwind one-and-a-half year marriage bookended by Jovovich's breakthrough performance in Besson's 1997 sci-fi actioner The Fifth Element and the story of France's infamous warrior saint. Jovovich brings an intensity to the role well-matched to Besson's stylistic energy, though this comic-bookish take on Jeanne D'Arc won't be winning any historical-society awards. An opening scroll sets the action as beginning in 1420, during "one of the darkest periods" in French history. A power struggle between France and England has confused divine right to the region's rule: France's king-in-waiting Charles VII (John Malkovich) agrees to give an army to peasant girl Jeanne, who appears to be the prophecied virgin of Lorraine. With a lusty, often amusing group of French warriors following her lead (including Tchéky Karyo, Vincent Cassel, Pascal Gregory, Richard Ridings and Desmond Harrington), Jeanne drives back the English invaders, but her power to inspire national morale quickly becomes a threat to the agenda of Charles and his manipulative den-mother advisor Yolande D'Aragon (Faye Dunaway). 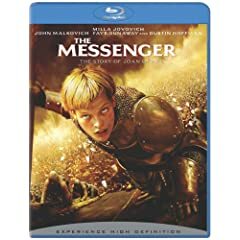 For a film of such considerable length (158 minutes), The Messenger doesn't seem to cover much narrative in much detail: there's a bit of Jeanne's childhood (including a traumatic childhood loss invented out of whole cloth), how her insinuation into national politics got her to the front lines, and then the conspiracy that led to her downfall: judged by British clergy and royals, burned at the stake as "the French witch" and thereby immortalized. Besson certainly enjoys the sensual possibilities of each of these acts, and he unsurprisingly puts an emphasis on Jeanne's so visually exploitable ecstatic faith ("I don't think. I leave that to God...I'm just the messenger"). Besson's splashy graphic sensibility doesn't know when to say "when," but he gets some mileage out of a theatrical tradition of embodying a voice from Jeanne's head: here, it's Dustin Hoffman, skillfully underplaying as Jeanne's hooded "Conscience." His psychic debates with Jeanne are the film's most intriguing scenes. Besson shoots nearly everything in wide-angle lenses, an approach that becomes tiresome. The style reflects Besson's irreverance for the historical record, which depicted Joan of Arc as preternaturally calm under fire and compassionate to her enemy, unlike Jovovich's adrogynous and fiercely pugnacious woman warrior. The film's Jeanne may hate to kill, but she also hates the British—this tug of war comes to a head when she begs the British to surrender rather than both sides sustaining a needless loss of life (in another anachronism of sorts, her "Conscience" will later needle her for her self-serving, un-Christian willingness to promote war). Even amongst her own, she's given to outbursts in apparent defense of God's wishes (she will not, for example, abide swearing from her comrades in arms). Besson doesn't stint on the comic aspects of the men in Jeanne's orbit, which gives the ever-overstated film a kind of wacky balance, and his vibrant use of color and viscerally gruesome gore in the battle scenes also lend the film a spirited lunacy. In its modern take on a defining historical moment, The Messenger isn't great history, but it's never boring. Sony gives The Messenger its Blu-ray debut in a fantastic looking transfer that's leaps and bounds over the previous DVD edition. Besson's vibrant colors jump off the screen, the picture is both crisp and film-like, and the source is clean. The Dolby TrueHD 5.1 sound mix is downright scary, capturing the creepy effects of the voices and dreams in Jeanne's head and putting the listener in the middle of the battles, with whizzing arrows, clanging swords, cannonballs, flames and the like. No extras on this bare-bones release (unless you count previews for other Sony titles and a BD Live hookup for...more previews), but regardless this is the disc to get for fans of the film, given the unbeatable A/V presentation. All site content © 2000-2019 Peter Canavese. Page generated at 04/19/2019 02:38:05AM.